Optimizing your profile makes it easier for Twitter users to discover and interact with your business. In conjunction with other optimized social media pages, it can also help establish a professional and consistent brand image. Setting up a standard Twitter profile is easy, but optimizing it for business takes some expertise. Whether you’ve just joined Twitter or have been active for years, these tips can help you make the most of your profile. Your username, sometimes referred to as your handle, is the unique identifier that starts with an @ symbol. This is how other users will mention and address you on Twitter. While there are over 332 million monthly active users, over a billion people have signed up for Twitter meaning there are over a billion different usernames out there. That means you’ll have to get creative when coming up with the right username because chances are, your ideal username is already taken. For common names that may already be taken, like Beyonce’s activewear line Ivy Park, consider adding a unique identifier (@WeAreIvyPark). Other options might have been @GetIvyPark or @WearIvyPark. Keep in mind, the ideal is to have a consistent username across all social networks; do your best! Make it relevant to your brand. Customers might actively search for you so you’ll want to make it ease. @Aldo is owned by a private account with no association to the brand. Aldo, the company, created @Aldo_Shoes instead. Simple, relevant and easy to find. Shorten irrelevant words and generic words into an initial. Social Media Examiner probably could have landed @SocialMediaExaminer; however, they went with @SMExaminer instead making it clear and concise. Twitter has recognized that a distinct username isn’t the one, single way users can find each other. With hundreds of millions of users, Twitter offers a powerful search tool that combines brand names and keywords. Lebron James’ Twitter username is @KingJames but his 30 million users didn’t seem to have trouble finding him. Because Twitter’s search tool is that good, it’s not the end of the world if you don’t get your perfect username. Keep in mind that you can always switch your username in your Twitter Settings. Optimization tip: For those just starting out with creating their social media presence, KnowEm can be used to verify username availability across a number of popular sites and social networks. Your profile photo is the square photo that appears on your profile and next to your Tweets throughout Twitter. It’s one of the quickest ways to identify an account, so use your company logo or something tied very closely to your brand. Recommended dimensions are 400x400 pixels. Optimization tip: To build strong branding and consistency, use the same profile photo on all of your social networks. Your bio is the 160-character description of your business on Twitter. It appears beneath your profile photo, and in Twitter and Google search results. Your Twitter bio should include the main keyword phrase you optimize your business with, plus links to your website or @mentions to other Twitter accounts related to your business. This approach will provide additional exposure in areas where only your bio is shown (like Twitter’s search results). You can also add a hashtag to help yourself get noticed. More on #hashtags later. 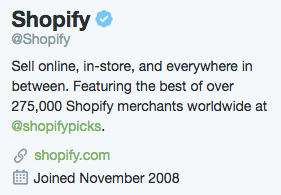 Twitter bios help customers find your profile and encourage them to click through to your website. Craft yours carefully. 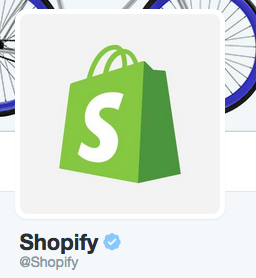 Optimization tip: If you're not sure what to include in your Twitter bio, take a look at your competitors. Tools like Rival IQ can provide a quick glance at other company bios and updates when they change. Try modifying some quirky bio ideas to better match your business using the Twitter Bio Generator. Simply copy and paste the bios you like, merge a few together, and enter your business’s keywords to make it your own. The Photos and Videos box in the left sidebar of your profile displays the latest photos and videos you’ve shared in your Tweets. Desktop users can click on the Photos and Videos link for the full gallery. 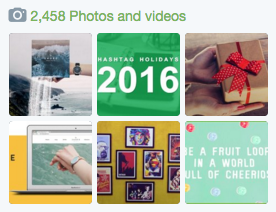 Optimization tip: Sharing photos and videos in your Tweets will help them stand out in your timeline, your followers’ main timelines, and in Twitter search results. If you’re Tweeting big news or a special announcement, try incorporating it into an image. Your header photo is the large graphic at the top of your Twitter profile. Recommended dimensions are 1500x500 pixels. You can use your header photo to promote your newest products or draw attention to new promotions and deals. Be sure to review your header photo on both desktop and mobile browsers to ensure it scales properly. Optimization tip: If you don’t have graphic design skills, you can use free tools like Canva to upload your own background image (or use a stock photo provided by Canva) and overlay it with text. Your Design settings will allow you to modify your Twitter profile background image, color and link colors. You can also use these settings to coordinate your background color with your header image, and to change the link color on your profile to something that matches your company branding.